Temporarily thwarted in our quest for Iceland’s fountain of youth, we decided to find coffee in the next town over. We pulled up to a restaurant that was also closed. Someone who happened to be walking by directed us to Cafe Bryggjan in Grindavík. Grindavík is a fishing village, and the cafe literally sits on the end of a commercial fishing pier. True to what you would expect at 9am on a Friday, it was empty but for three sea captains having their morning coffee and laughing. We cautiously walked in, ordered coffee from the man at the counter (the owner? ), and took a seat. Within seconds, he approached us with a stack of books about Iceland in assorted languages and struck up a conversation. He was exceptionally friendly and sincerely interested in helping us really come to know Iceland. We ordered breakfast and were shocked by what arrived: a platter with four sliced hard boiled eggs, four slices of toast, four slices of grain bread, sliced tomatoes, sliced cucumbers, sliced ham and a local lamb-based deli meat. 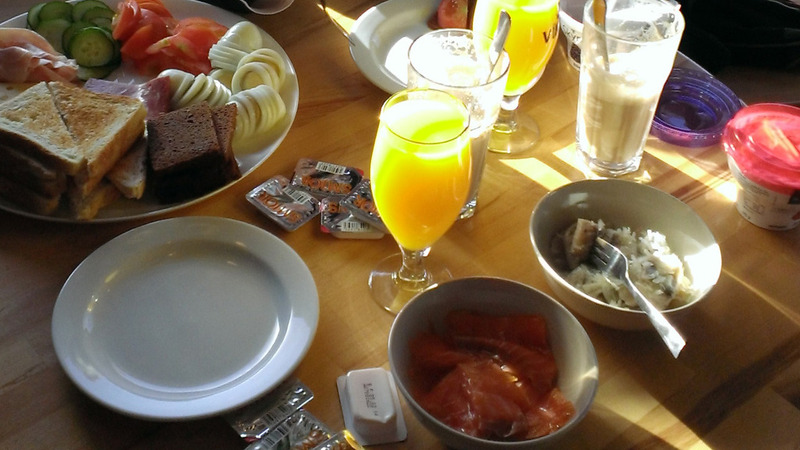 As we marveled at the amount of food before us, still more appeared: a bowl of salmon and a bowl of herring next. We both looked at the fish and gave each other a quick, understanding glance. It would be rude of us not to eat this, but we knew from past experience that herring was not our thing, and the volume of salmon was, well, excessive for two landlubbers. While we tried to figure out who would take this hit for the team, the owner left the cafe. He returned a few minutes later with two containers of Skyr, a uniquely creamy Icelandic version of yogurt. He had gone to the store to get some just so that we could sample yet another truly Icelandic item. We both left full of food and giddy with enthusiasm. In our first two hours in Iceland we had already seen mind-bending scenery, eaten a great meal and met an awesome local. We also discovered that herring for breakfast is surprisingly delicious when it’s marinated in sugar, vinegar and onions. At this point, it had been about 24 hours since we left home. We felt obligated to honor the Cafe owner’s request and felt a little guilty about our previous plan to go spend most of the day at Blue Lagoon. There’s plenty to read about Blue Lagoon elsewhere online and everything you will read about it is true. It’s fun, relaxing, unique, touristy, warm, blue, etc, etc, etc. You could certainly spend a day, or several there, but we were in and out in about two hours. Freshly showered and suddenly wide awake and alert, we drove away from Blue Lagoon and Reykjavik in search of nature. I cannot overstate how serene the isolation was. We often drove for miles at a time without spotting another car on the road. To the left was vast natural expanse, to the right, the Atlantic. 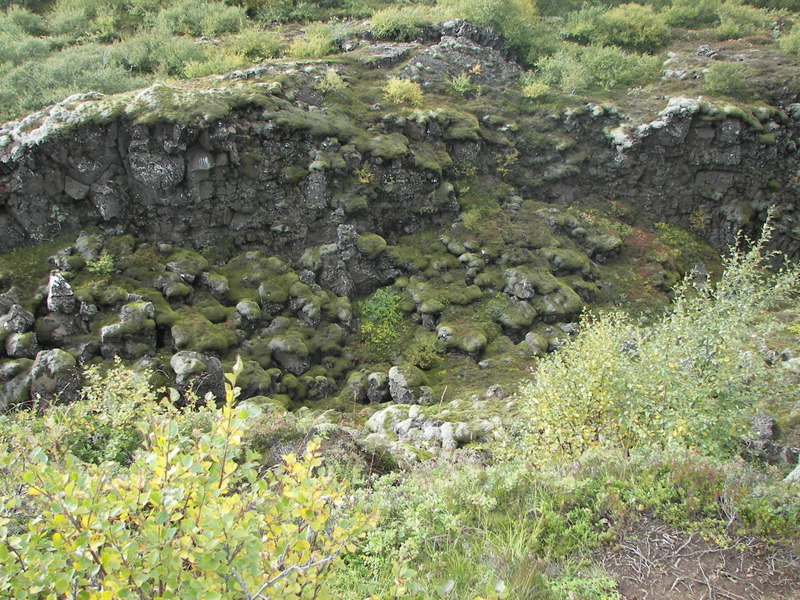 At assorted points along the drive, we pulled onto the shoulder to hop out and stare at random geological formations or plant life (a practice which is both allowed and encouraged in Iceland). It was one of those rare afternoons of doing nothing yet still being totally entertained. On the horizon, there was a break from some of the natural scenery: an enormous flagpole supported a flag emblazoned with a coffee cup. We ambled down a gravel side road toward what looked to be a closed campground. A few yards (meters) futher down we found a small café, T-bær Coffeehouse, that showed no signs of being open. We were surprised to find the door unlocked. As we walked in, a woman emerged from the back smiling and speaking in Icelandic (I think?). Despite our mediocre French and German skills, we were unable to find a common language. We ordered by smiling a lot, holding up two fingers, and pointing at the coffee pot. Then I uttered the word cappuccino which I have found to be fairly universal anywhere in the world. We took seats by the window to stare out over the ocean. Still unclear on what language we spoke, the café keeper promptly delivered us multiple copies of one book in different languages. It was the abridged history of a local landmark. We had unwittingly stopped just a short distance from a small, well known oceanfront church called Strandakirkja. During the 1970s, it was almost completely swallowed by water. A concerted effort to build a retaining wall around the church and adjacent cemetery saved them from certain doom. We stayed for two cups of coffee before getting back on the road. The last planned stop on our first day loop was for dinner in the town of Stokksyri. The restaurant, Fjorubordid, was famous for Icelandic lobster tails. 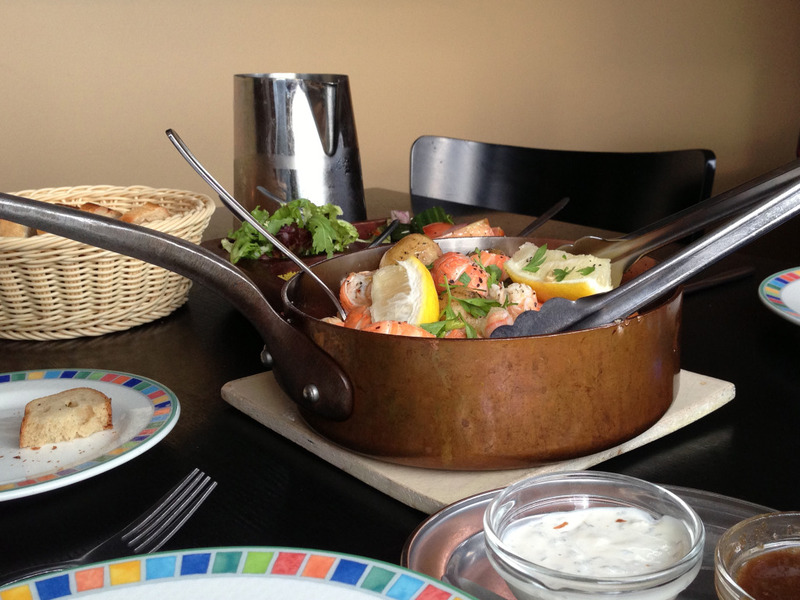 Icelandic lobster are far smaller and lighter in color than their American counterparts, but equally delicious. We were presented with a three course meal consisting of cream and tomato based lobster soup, then a pot full of tails and stew vegetables in a white broth, and finally a dessert we had to decline on account of being too full. Well worth the drive. Fed and exhausted, we pointed the car toward Reykjavik. Getting into and around downtown was surprisingly easy. Our self-service rental apartment at Welcome Apartments was a breeze to find and included free parking in a small four car lot behind it. We showered before heading out on foot to explore downtown. Now nearly 36 hours into our “day” we did not expect it to be much of a late night. We scouted the locations of several restaurants we had read about and tried to get the lay of the land. The Lebowski, a predictably bowling themed bar and restaurant, caught our attention. We sat at the bar and sampled our way through the different Icelandic beers on tap before calling it a night. On the walk home, we hunted down a 24 hour grocery store and loaded up on snacks, sandwich-making supplies and condiments.